MxMo LXXII: Drink Your Vegetables — Ciao, Provence! Vegetables? It’s too early for vegetables! At least, it’s too early for veggies from our garden — we’ll be waiting two months, at least, for fresh, homegrown tomatoes, peppers, and eggplants. Rowen, of the Fogged In Lounge, however, has asked us drink bloggers to mix up vegetable-inclusive cocktails for the latest Mixology Monday. Shake the gin, syrup, vermouth, and Cynar with ice. Add the soda to a chilled coupe or cocktail glass, then strain the shaken mixture into the soda water. Alternatively, serve in a rocks glass over a large ice cube, with a sprig of basil, oregano, thyme, or rosemary as a garnish. The C.P. was designed to mimic the flavors of one of our favorite summertime dishes — the Eggplant & Zucchini Gratin from Julia and Jacques: Cooking at Home. The dish is essentially ratatouille in gratin form: a flavorful blend of meaty, acidic vegetables topped with a toasty crust that includes herbes de provence and fresh Parmesan-Reggiano. When made with tomatoes, eggplant, and squash picked from our garden, the gratin is phenomenally good. While there is no cheese, zucchini, or eggplant in the drink, it manages to recall the gratin’s flavor profile remarkably well. 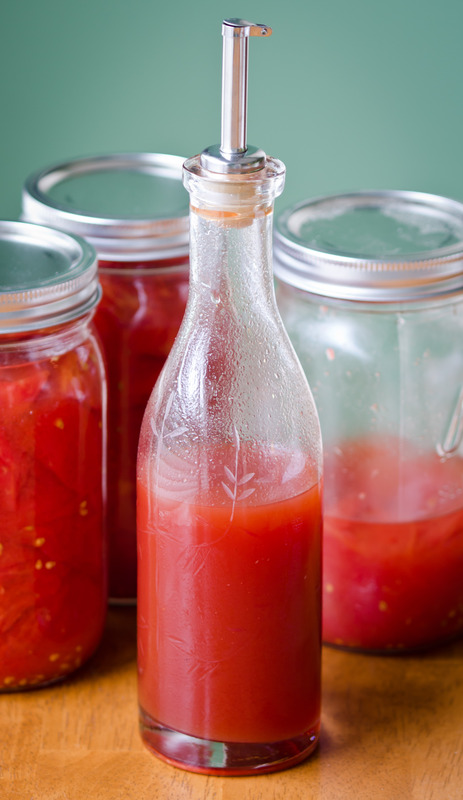 The tomato syrup itself, being made with preserved tomatoes, rather than fresh ones, is more savory than usual, emphasizing the vinegar and taking on a tomato-soup-like quality. The Cynar stands in for the eggplants of the gratin, contributing a caramelized, herbal meatiness and a slight bitterness to the drink. And since the Cynar contains artichokes (though you can’t really taste them), it counts as a vegetable component for our MxMo roundup. The grain-heavy flavor of the Catoctin Creek Gin that works so well in the Tombasi is equally effective as a binder or middle-man in the Ciao, Provence. 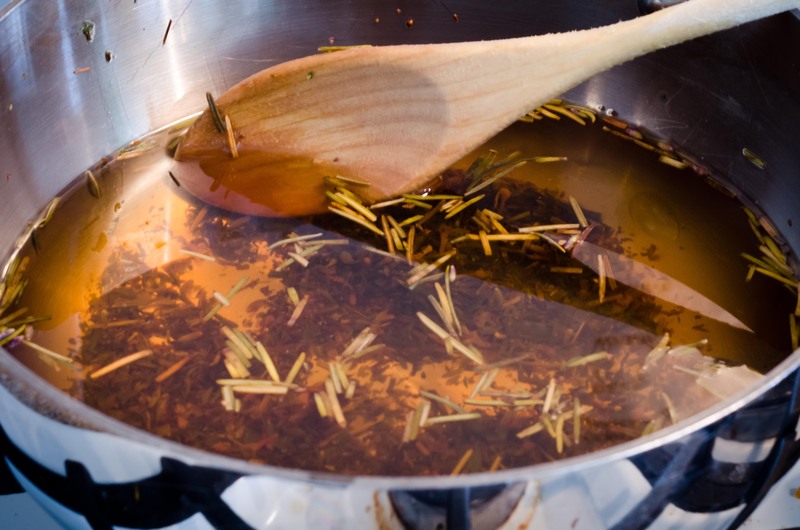 A significant amount of the drink’s flavor — and the signature accent of the gratin — comes from herbes de provence, a blend of dried herbs that includes savory, fennel, basil, thyme, oregano, and lavender. Though the blend itself, and its use of lavender, are modern, somewhat Americanized developments, the component herbs have been used in the south of France for years, and its flavors work remarkably well in French cooking. We often use it to jazz up our tomatoes, chicken, and green beans. A week or two ago, I made up a bottle of Vermouth de Provence, basically Noilly Prat dry vermouth that has been infused with its namesake mix of herbs. 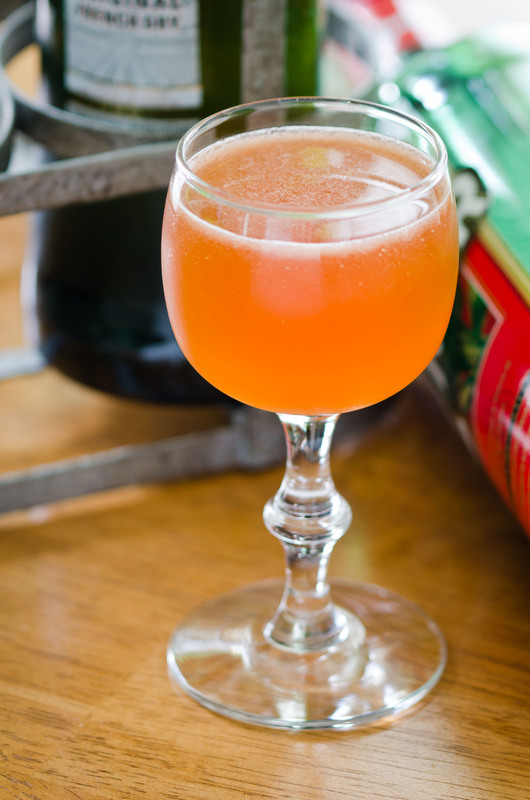 The recipe comes from Speakeasy, by Employees Only in New York, and is a critical component in their a Frenchified gin Martini, the Provençal, which is rather dry, heavy on lavender, and accented by orange — a nice apéritif. Not wanting the vermouth to go to waste — no single-use ingredients, remember? — I included it in the Ciao, Provence, where its dryness and powerful flavor help round out the drink. If the Ciao, Provence comes out a bit too concentrated for your taste — it’s a little on the sweet side when it warms up — simply serve it on ice, perhaps adding a bit more soda to balance out the sugar. The C.P. is certainly a savory drink: think of it as a French-Italian Bloody Mary in miniature. Finally, a lemon twist or fresh sprig of a component herb would not be out of place as a garnish, especially in the lengthened version. Liquefy the tomatoes in a blender, then strain through a chinoise or fine mesh strainer and set aside. You’ll have 1 to 1-1/2 cups of fine puree. Once the vinegar-sugar mixture is somewhat cool, add the lemon juice and tomato puree. Stir to combine. If the mixture separates a little, reheat on low while stirring. Bottle and refrigerate; best used within one week. Toast the herbes de provence in a small sauce pan over medium heat until fragrant, about two minutes. Add 2 cups of the vermouth, bring to a boil, then remove from the heat. Let stand until cool. Add the remaining vermouth and strain through a cheesecloth or coffee filter. Bottle and store at room temp; will keep indefinitely. great post. Sometimes I wish I could be so elocuent as you guys but then I start droppin F bombs like it’s 1999 and all is lost. Glad you liked the photos, Raul! Yours are pretty snazzy, too. Don’t worry about the F-bombs — the cocktail world could use a few more of them. Livens things up a bit! Saw that you’re in Boston — the Eastern Standard was awesome, last time I was there. This entry was posted on April 19, 2013 by IJ Lauer in Cynar, Drink Recipe, Dry Vermouth, Gin, Infusions, Ingredient Recipe, Mixology Monday, Original Drinks and tagged cocktail, cynar, dry vermouth, gin, herbes de provence, homegrown tomatoes, mixology monday, recipe, tomato, vegetables.